Gio Casmiro, who's in second grade, participates in an orienteering activity. He's joined by his Cubmaster, Tae Brown. Winston Shearin, member of the training committee for the Terrora District, leads cubs in an orienteering activity, during Cub Parent weekend at Camp Daniel Boone, on Apr. 6. Boy Scouts isn’t just for the boys anymore. The organization last year announced it would begin welcoming girls. 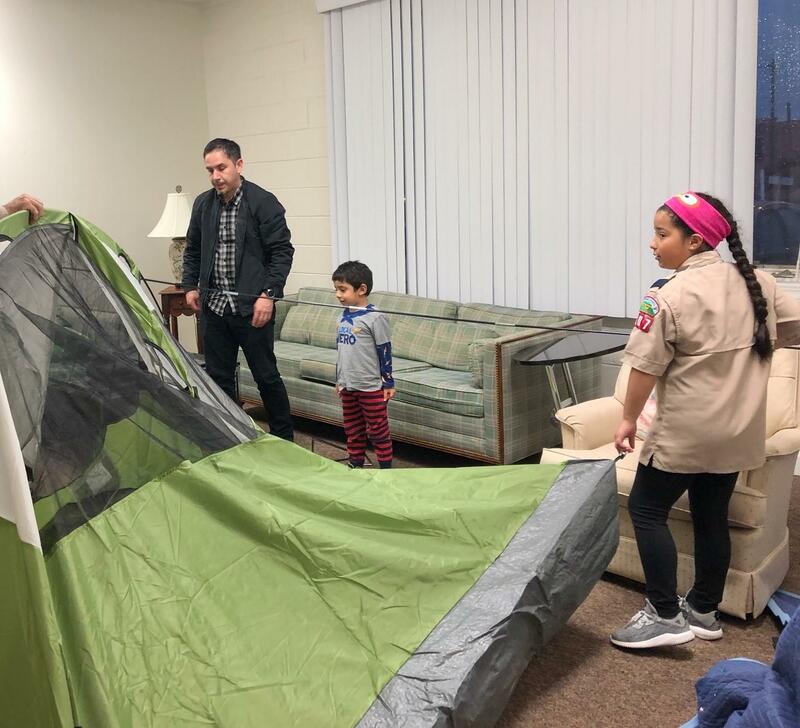 Since the change, a new Cub Pack in Henderson County started up as an opportunity for Latinx kids to engage with the community and develop those trusty Scout leadership skills. Earlier this month, Pack 607 took its first overnight trip to Camp Daniel Boone, in Canton, for Cub Parent weekend. During one particular activity, about 30 kids in Scout uniforms crouched over maps of North Carolina, laid out on a patch of gravel. Meanwhile, camp official Winston Shearin called out directions for their first lesson in orienteering. He perfected his outside voice as a Marine at Camp Lejeune. “Point your toes andyour nose in the same direction as your arrow,” Shearin shouted, and accordingly, the mass of Cub Scouts pivoted to face North. Two cubs from Hendersonville, second grader Gio Casmiro and fifth grader William Quintero Gonzalez, were partnered together on the assignment. They used a small brass compass to orient their location on the map. After about 20 minutes, they picked it up pretty quickly. Casmiro points to Cold Mountain, a few miles away from the Daniel Boone campground. “We’re somewhere here on the map, so the water’s at West,” Casmiro said, pointing toward the nearby lake. While the scouts oriented themselves, a few parents were seated on the steps to the mess hall, watching. They were visibly entertained by the spectacle. Yadira Diaz was one of them. “It’s an opportunity to learn, to socialize,” Diaz said. “Es una oportunidad para aprender, de socializar…. Her son Adrian joined Cub Pack 607 three months ago. Already, Diaz says, she’s noticed changes in his confidence and behavior at home. That outcome is just what the pack’s founders had hoped for when they decided to apply for a charter last April. “What’s satisfying is seeing the parents get involved. And these are parts of the community that were not engaging with scouting, so it’s really good to see them participate in the community. It’s win win for everybody,” George Pappas said. Everybody, including girls. That recent change got Pappas started on the idea of forming a Latinx cub pack in Hendersonville, where he practices immigration law. It should also be noted, he’s a proud Eagle scout. But through his work processing Deferred Action for Childhood Arrivals, or DACA, applications, Pappas noticed a discrepancy among his clients -- the children of immigrant parents. Itsiana Gomez is one of five girls in the new pack. She hopes others will join. Cub Pack 607 is one of 31 scouting groups that make up the Terrora District, which covers Transylvania and Henderson Counties. Of the packs represented during the Cub Parent weekend trip, Pack 607 is by far the most diverse. “I think it’s awesome,” Sarah Barnett, senior district executive said. She says Pappas’ knowledge and contacts within the Latinx community were essential for getting the new pack off the ground. “It’s definitely an area that we wanted to get more service to, but at least for me, I’m not bilingual. So that has been a stumbling block,” Barnett said. Fast forward a few months, and Pack 607 is coming up on its first full year. Thirteen kids have been regularly showing up to pack meetings, which are led in both Spanish and English. Their most recent meeting came days after their camping trip. You could still hear the excitement in their voices. “Saturday, in the night, we got to make s’mores, so that was probably my favorite part,” Itsiana Gomez said. Gomez is in fourth grade, which makes her a Webelos -- a rank that stands for “We’ll Be Loyal Scouts.” Gomez says it was her first time camping in the woods. In fact, many of the activities that weekend were a first, like shooting BB guns and singing camp songs. She says she wants to see more girls like her doing it too. So far, there are five girls total in the pack. Leaders are continuing to spread the word and apply for grants, so Western North Carolina’s first bilingual cub scout pack will continue to grow. Last month, Immigration and Customs Enforcement officers arrested nearly 300 people across North Carolina. Those arrests are still sending shockwaves throughout Western North Carolina’s Latinx community.